NEW 2014 Stampin' Up! Catalogue is HERE! How exciting! The brand new Stampin' Up! Catalogue is out and it's utterly AMAZING! To view it in .pdf format, click HERE. To view it via the Online Store, click HERE. 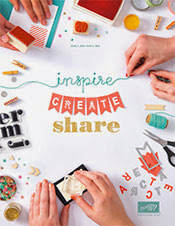 For the list of Stampin' Supplies used to create all the projects inside, click HERE. All in all, there are some wonderful new additions of stamp sets, papers, new In Colors, accessories and enough crafting supplies in general to simply blow your socks off. So go check it out, and happy stamping!